Free Shipping Included! 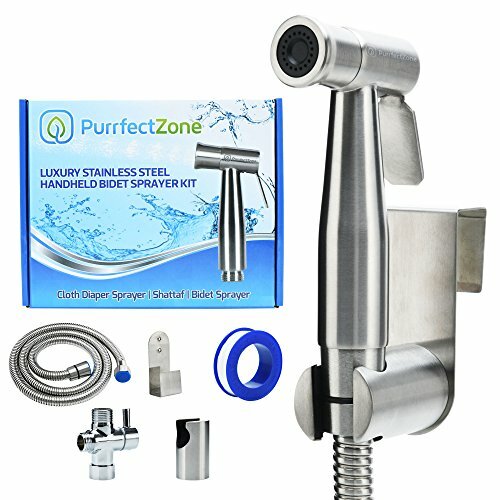 PurrfectZone Luxury Handheld Bidet Sprayer Set - Baby Cloth Diaper Sprayer - Hand Held Muslim Shattaf Kit - Premium Stainless Steel & Brass T-Adaptor- Low to High Water Spray, Wall or Toilet Mount by PurrfectZone at Wakaf Center. Hurry! Limited time offer. Offer valid only while supplies last. ✅ LOOKING FOR A HIGH QUALITY HAND HELD SPRAYER? Weather you use as bidet, shattaf or cloth diaper washer, we know you want and deserve the best. ✅ LOOKING FOR A HIGH QUALITY HAND HELD SPRAYER? Weather you use as bidet, shattaf or cloth diaper washer, we know you want and deserve the best. Our t-valve is made of top premium brass core constructed by forging with ceramic disc cartridge which helps to control water pressure easily and prevent water leakage. Our flexible hose is made of premium grade stainless steel and EPDM inner tube with enhanced double-lock system which helps to prevent breakage and water leakage and means the bidet is going to last. The flexibility of the hose makes it possible for the user to get the sprayer at the perfect angle. ✅ HEALTH CONCERNS? The young, old, & those with health concerns will be able to use easily. ✅ POSTPARTUM HYGIENE? using a bidet ensures a cleanliness level that is sanitary & soothing. ✅ WATER PRESSURE? The water pressure can be adjusted from a gentle rinse to strong jet spray. ✅ INSTALLATION TIME? All parts can be hand tightened. No plumber needed. ✅ LEAK PROOF DESIGN - THE DIFFERENCE : While other handheld sprayers are made of abs plastic, our sprayer is made of premium SOLID STAINLESS STEEL in brushed nickel finish. While other hand held sprayers have hoses with a pvc inner tubing, our hose is very FLEXIBLE and made of top grade premium stainless steel with enhanced double-lock system and EPDM inner tube. This design ensures that you will NEVER have to worry about leaks. Instead, you will enjoy a frustration-free experience. ✅ UNCOMPARABLE PERFORMANCE: While other t-valves are made by welding, our t-adaptor is made of solid brass core with ceramic disc cartridge; This design ensures you can CONTROL WATER PRESSURE EASILY from a gentle rinse to a strong jet spray and will not need to worry about splash back or leaks from breakage. You will love using our sprayer. ✅ QUICK & SIMPLE INSTALLATION: All parts can be installed & tightened by hand and a tool is not necessary. This can be done in less than 10 minutes; no plumber, electricity or batteries needed. Our bidet attachment system comes with complete accessories and includes both wall or toilet mount options and suitable for left or right hand use. If you have any questions about this product by PurrfectZone, contact us by completing and submitting the form below. If you are looking for a specif part number, please include it with your message.